While SSL/TLS provides privacy and authentication, it also creates a blind spot for enterprise security. Cybercriminals can use SSL to hide their exploits from an organisation’s security controls, including Next Generation Firewalls (NGFW), Intrusion Prevention Systems (IPS), Unified Threat Management (UTM), secure gateways, Data Loss Prevention (DLP), anti-malware solutions, and more. 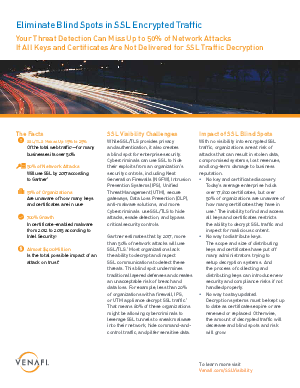 Download this Solution Brief: Eliminate Blind Spots in SSL Encrypted Traffic to learn how to detect security threats.